Today we’re with the top 10 best college list of Bangladesh. Before taking admission to the college, it’s very important to know about the best college. After publishing the result of SSC (Secondary School Certificate) exam, the college admission process starts. The goal of all is one- the best college admission whatever the results come up. As there are many fears among the best college according to the board, many people think of where to be admitted. That’s why we’re here to help them who are looking for the top colleges to get admission for their HSC (Higher Secondary School) course. If you notice then you’ll find that most of the top colleges are located at the Dhaka, the capital city of Bangladesh. This is because most of the students who passed the SSC exam they like go to Dhaka to get admission. How to Select the Best College for Admission? Among other reasons, the first and foremost one is that the best college has the best environment of education while they have the best teachers in the country. And there are many other reasons to do so. That’s why it’s essential to find out the best one as it relates the future of a student. Although not to mention research and an often lengthy application process, finding the right college takes time and effort. It may be a good idea to Following a boyfriend, girlfriend, best friend to the college of their choice. You can follow in the footsteps of your father, mother, and siblings to find the best college. Avoid choosing a college that’s out of spite. Consider whether the college has a great learning environment or not, if not then avoid it. As they probably are just that, you should ignore these stereotypes. While assuming to worst, don’t apply to certain colleges. Not the sole decision maker, but the location should be a factor in choosing a college. Think about the costs and your ability before admission. It’s good to visit the college before admission. 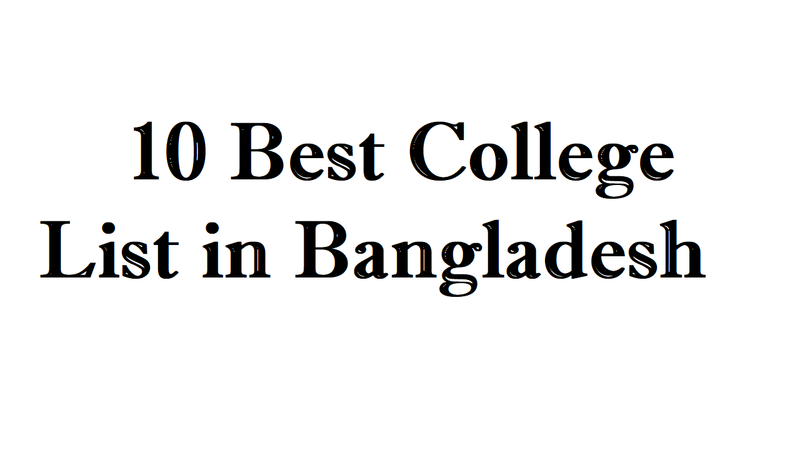 What is the Top10 Best College List in Bangladesh? When you’ll search for the best college in Bangladesh, you’ll find there are three types of colleges over there. Apart from the Bengali and English medium colleges, there are Madrasas. But, those who study in the English medium previously they get admission in the same medium and the things are same for Bengali and Madrasa medium. In Bangladesh, a college-level study known as HSC that starts after students pass the SSC. It means that students will admit into college after passing school level. Now, we’ll look for the best college in Bangladesh. Notre Dame College is the best college among any other colleges in Bangladesh, which was established in Dhaka in November 1949. Because of the crisis in the education sector of newborn East Pakistan, it was established by the Roman Catholic Priests from the Congregation of Holy Cross. The college was formerly known as the St. Gregory College, which is an extension of the St. Gregory’s School and it was also established by the mission. And as renamed Notre Dame College, it was relocated to its current location in Motijheel in 1954. Adamjee Cantonment College (ACC) is mainly for the children of Army personnel stationed in Dhaka Cantonment, which is managed by Bangladesh Army officers. Formerly the college ranked the first in HSC result in Dhaka Board as the college is enriched with its education and club activities. An eccentric industrialist, Gul Muhammad Adamjee was the founder of the college and it’s now under the command of Principal Brigadier General. This is one of the best colleges in Dhaka and in Bangladesh as well. As Shaheen School (English Medium), the college was established on 1 March 1960. But, in parallel with English medium, Bangla medium was introduced from 1967. Opening intermediate level from 1977, Shaheen High School was renamed as BAF Shaheen College Dhaka. Run by the BSB Global Network, and established in 2004, Cambrian School and College is a secondary and higher secondary school in Bangladesh. With 16 campuses in Dhaka and Chittagong, Bangladesh, Ln. M.K. Bashar is the chairman and Ln. Golam Mostafa is the principal of the college. Although it’s a new college, it’s advanced than many other ancient colleges of Bangladesh. As one of the oldest colleges in Bangladesh, the Dhaka City College (DCC) located at Dhanmondi, kudrat-e-Khuda road in Dhaka city. Apart from the HSC course, it offers graduation and posts graduation course in majors. Affiliated with the National University, the college was established in 1957 under the patronage of educationists and social workers. It’s not only the oldest college but it’s one of the best choices of the students as well. Dhaka College is the earliest HSC educational institutions of Bangladesh that’s very essential as well. As an English Seminary School, James Taylor, a civil surgeon at Dhaka, was the founder of the college and it was established in July 1835. and this is one of the famous colleges that have produced a lot of famous persons across the various fields of the country who are working for the different sector in Bangladesh. It has been achieving extraordinary results with flying colors in PSC, JSC, SSC & HSC exams along with an innumerable number of golden 5 and our success rate is 100% every year since the inception of this institution. Situating in Uttara, Dhaka about a kilometer north from Shahjalal International Airport, RAJUK Uttara Model College (RUMC) is a co-educational Bangladeshi secondary school. Besides, after establishing in 1994 the school provides education to its students in Bengali and English medium under the national curriculum. Located near Uttara at Dhaka in Bangladesh, Uttara Town College was established in 1998. Along with a 5 storied building and it has a big place in front of it, it has a playground for playing. Also, it’s promising to teach a quality education to their students. Another best college of Bangladesh based in Dhaka, Milestone College is the institution that has an elementary school, a middle school, and a secondary school section. And as the current principal of the college, Mr. Shahidul Islam is on the lead.